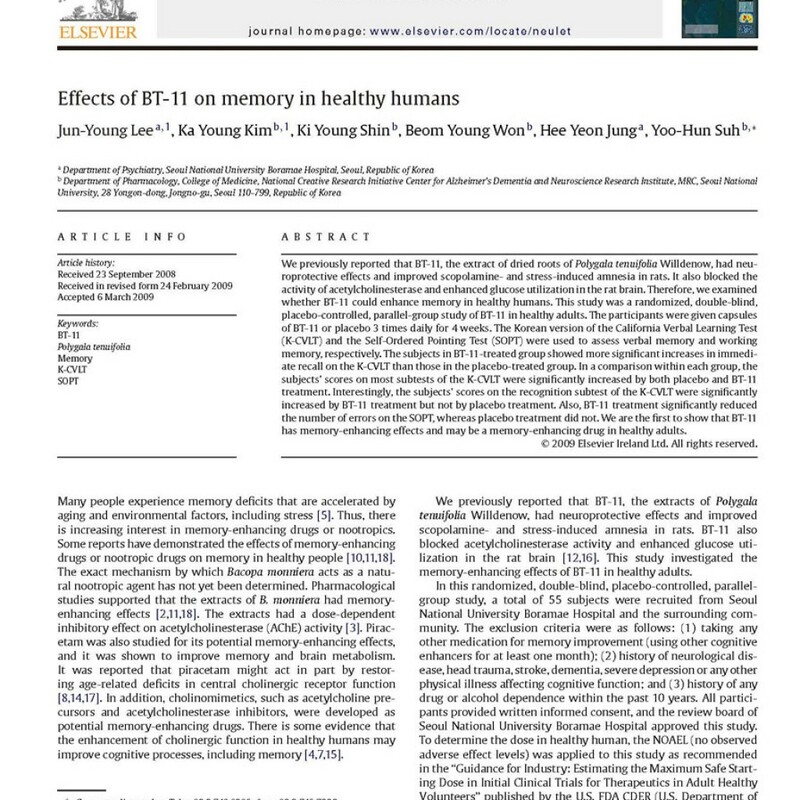 In this randomized, double-blind and parallel-group study of BT -11 in health adult appealing to memory deficits, We assessed cognitive function involving memory 2 month later. 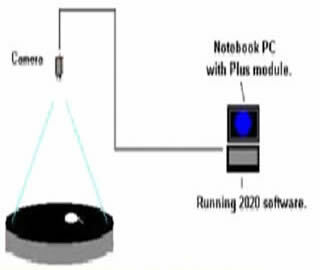 This assessment was investigated by using Korean version of Consortium to Establish a Registry for Alzheimer’s Disease Assessment Packet (CERAD-K). This study was recruited by a total of 60 normal adults and only 53 of all recruiters finished this study. 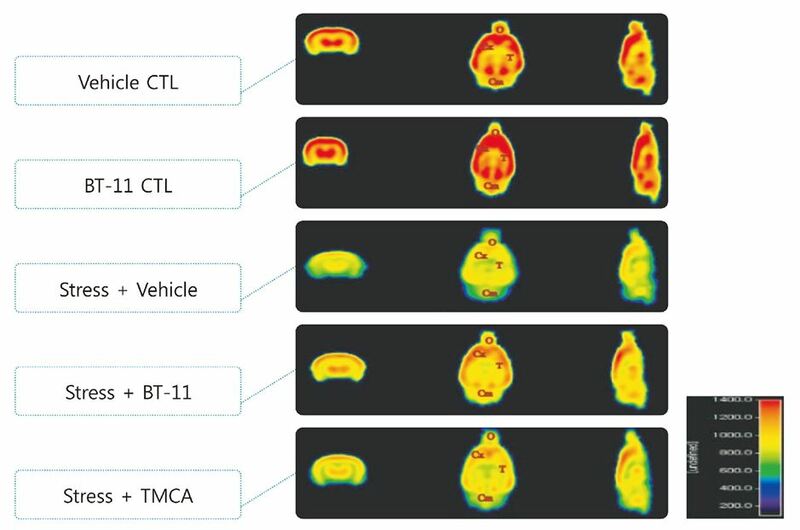 The total scores of CERAD-K were significantly increased more in the BT-11 treated group than in the placebo-treated group(P=0.003). In Word list recal l, constructional praxis, constructional praxis recall, Boston naming and trail making test A of subordinate scores, the scαes were significantly increased more in the BT-11 treated group than in the placebo-treated group. In this test there was no side effect except a slight dyspepsia. 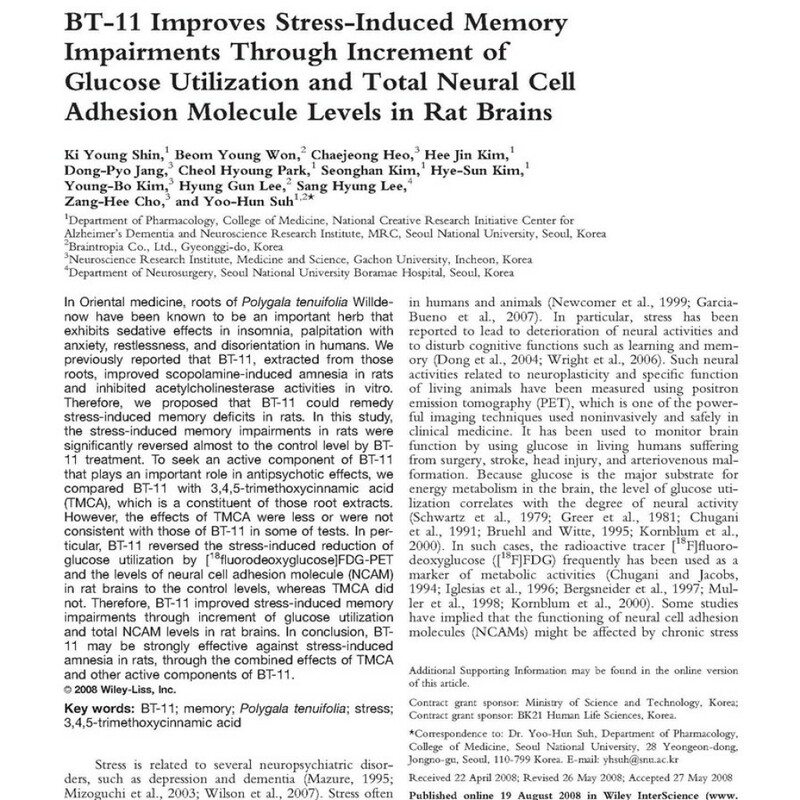 This result suggested that BT-11 improved cognitive function in normal adult and it could be closely related to effect of memory improvement. 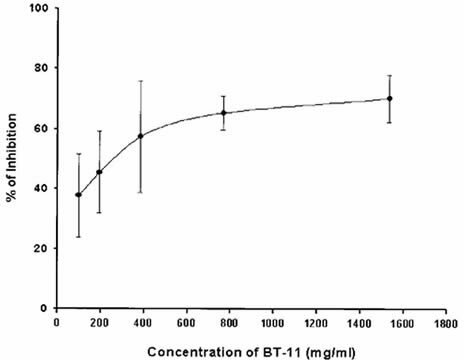 BT-11 may be nutraceuticals to enhance or prevent cognitive dysfunction such as AD. 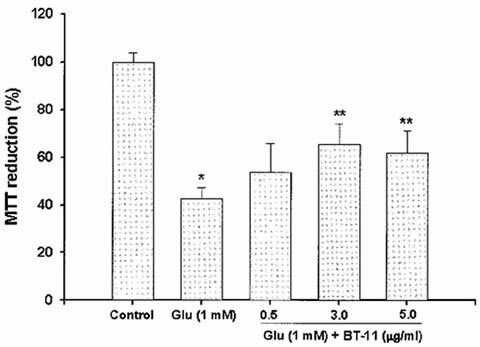 It has been previously reported that BT -11, the extract of d ried roots of Polygala tenuifolia Willdenow, inhibited activity of acetylcholinesterase, neurotoxicity of Glutamate(Glu) and amyloid ß protein. 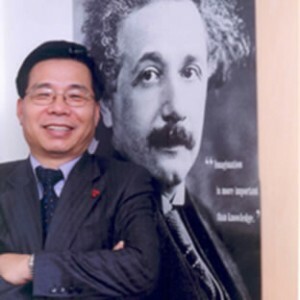 Additionally In clinical test of the elderly aged 60 and over, there were much more improvement of cognitive function in the BT -11-treated group. Especially, word list recognition was markedly improved in BT-11-treated group than in placebo-treated group. 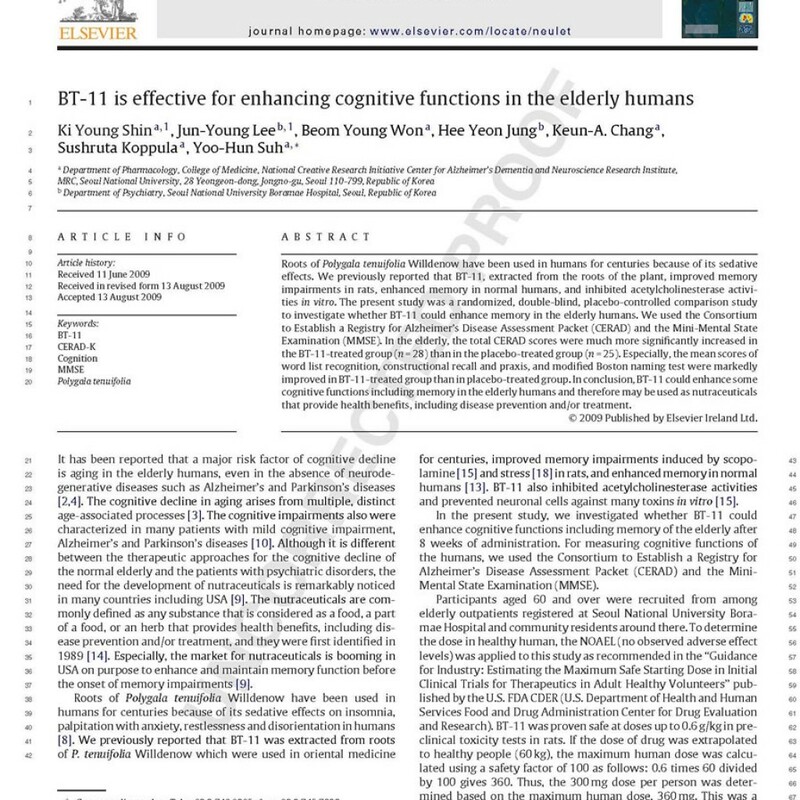 This study could be examined whether BT-11 could enhance memory in healthy humans like in the elderly aged 60 and over. This study for those aged from 16 to 64 was a randomized, double-blind. 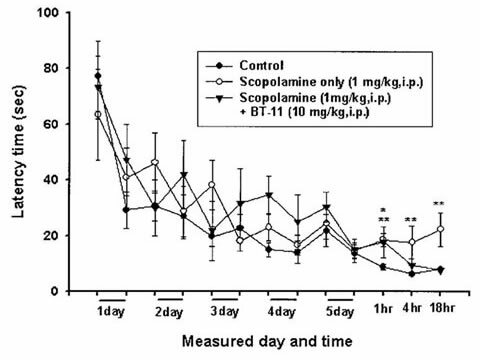 The participants were given capsules of BT -11 or placebo 3 times daily for 4weeks. And then we assessed any changes of cognitive functions including memory. 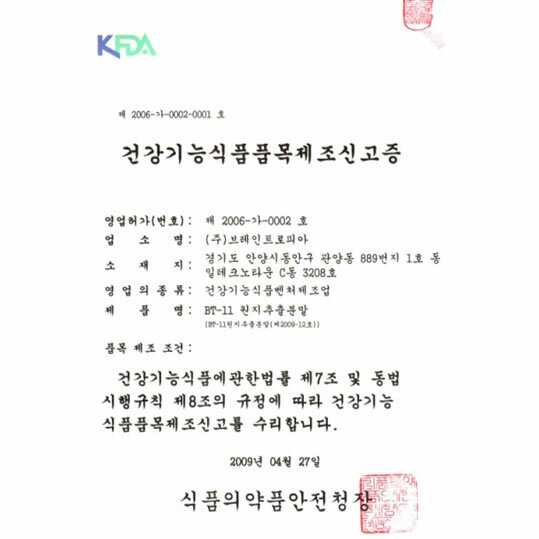 The Korean version of the California Verbal Learning Test(K-CVlT)and the Self-Ordered Pointing Test(SOPT) were used to assess them. 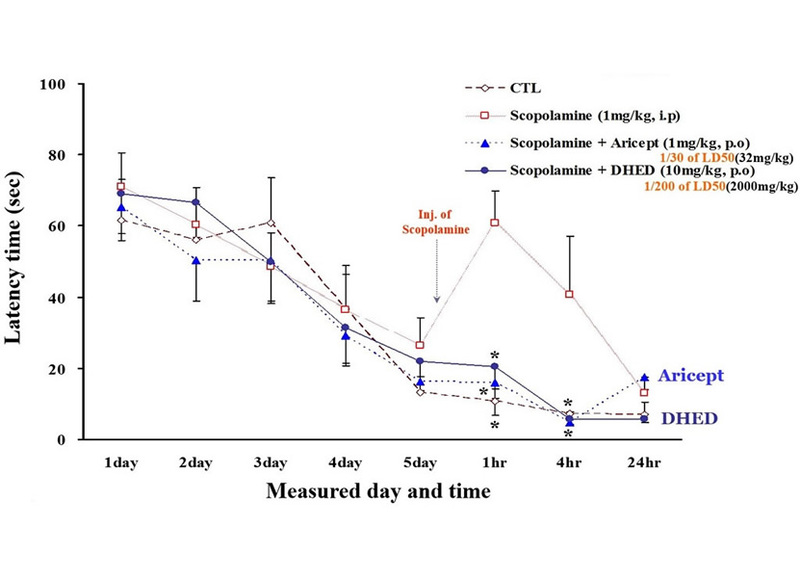 55(BT -l1-treated group=26, placebo-treated group=29) subjects participated in this study. 48(BT-11-treated group=23, placebo-treated group=25) participants completed the 4 week study. 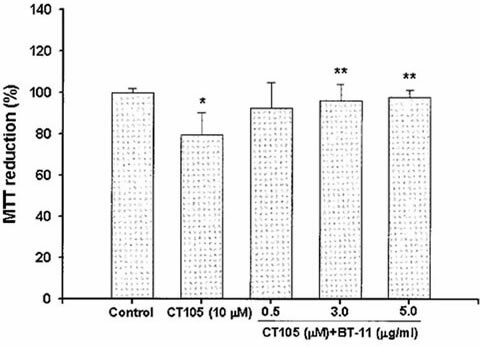 In entire K-CVLT, the BT-11-treated group(12.96:t 5.59) showed statistically significant increase in a comparison to the placebo-treated groups(p=0.042). And although scores in free recall and long-delay recall and recognition were remarkably increased, there were no statistically significant differences. There were no serious treatment-related side effects for all the 48 participants. 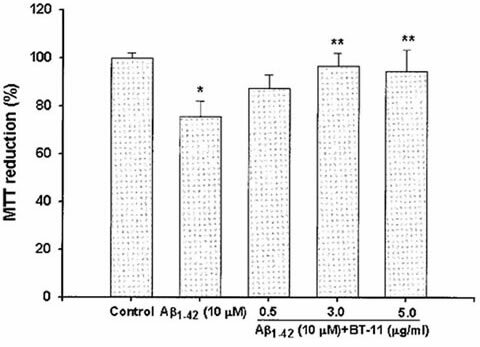 This style suggested that BT-11 significantly improved working memory in a comparison to placebo. The root of Polygala tenuifolia Willdenow has been used for the treatment of insomnia, depression, and amnesia. However, the toxicological properties of the herb have been overlooked, because it has been used for a long time for various purposes. 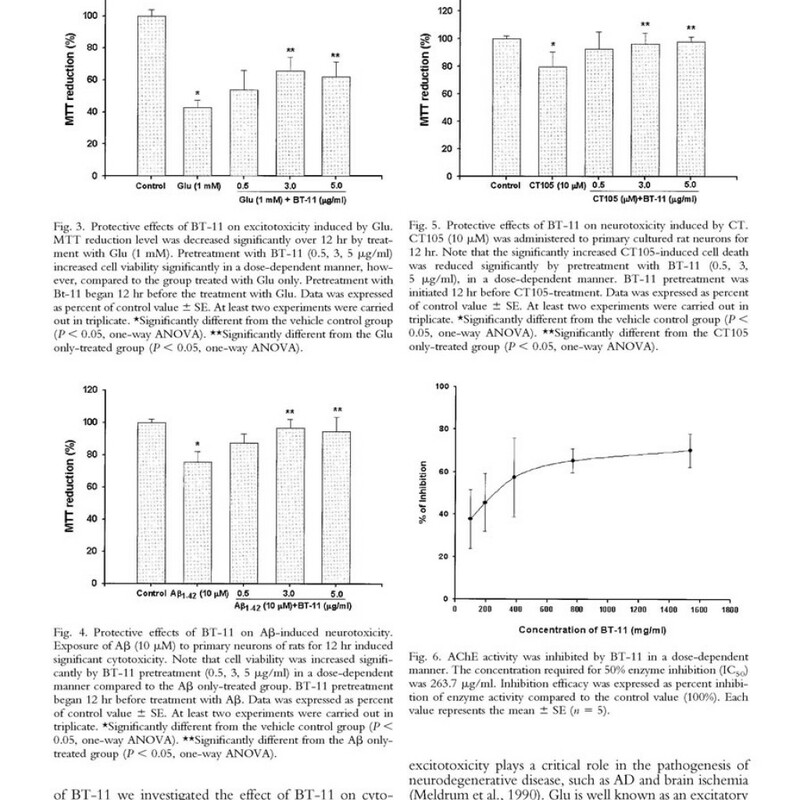 In this study, we evaluated the preclinical safety of the root extract in rats and beagle dogs. 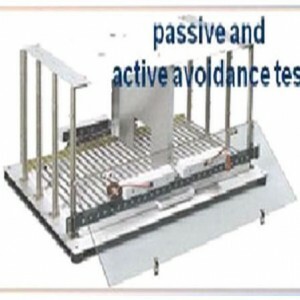 First, the acute oral toxicity was tested in both rats and dogs. In the rats, only one female of 2g/kg died, but no treatment-related death or clinical and gross findings were observed after the administration. No toxicological changes or mortalities related to the test substance were also observed after the administration in the dogs. 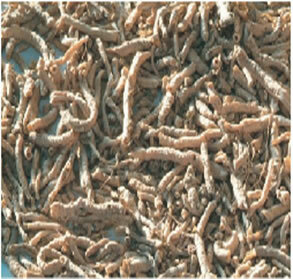 Although vomiting, discoloration or hemorrhage was found in some dogs, there were no serious abnormalities. 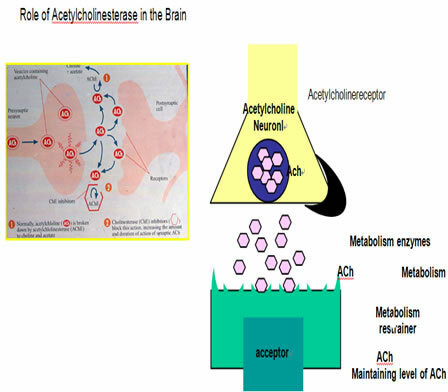 Second, the subchronic toxicity was investigated in the rats. Two animals were found dead in the female group of 1,000 mg/kg/day, but there were no abnormal findings associated with the test substance. 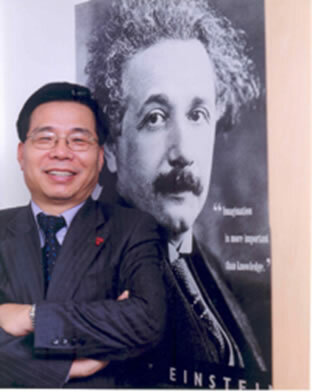 There also were no adverse effects on the clinical signs, body weight, hematological and biochemical findings. 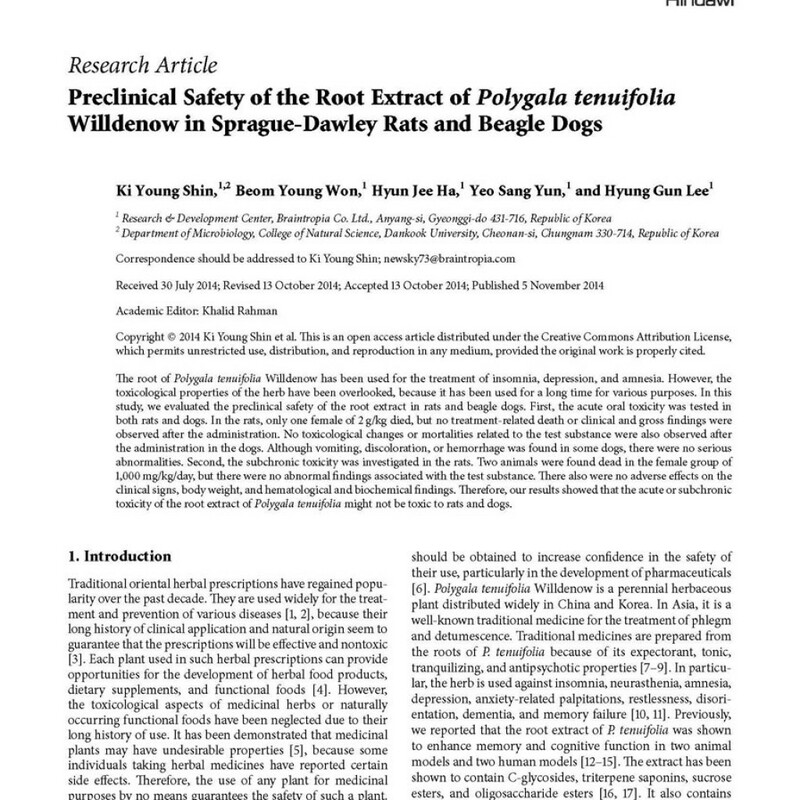 Therefore, our results showed that the acute or subchronic toxicity of the root extract of Polygala tenuifolia might not be toxic to rats and dogs. The root of Polygala tenuifolia Willdenow has been used for the treatment against insomnia, amnesia, depression, palpitations with anxiety, and memory improvement. However, there is no sufficient background information on toxicological evaluation of the root to given an assurance of safety for developing dietary supplements and functional foods. 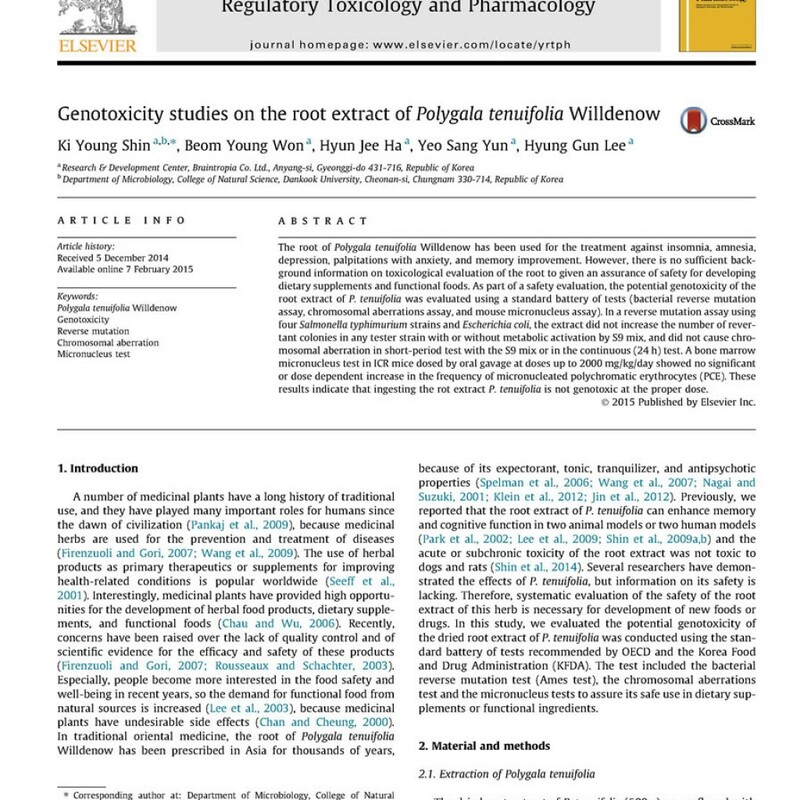 As part of a safety evaluation, the potential genotoxicity of the root extract of P. tenuifolia was evaluated using a standard battery of tests (bacterial reverse mutation assay, chromosomal aberrations assay, and mouse micronucleus assay). In a reverse mutation assay using four Salmonella typhimurium strains and Escherichia coli, the extract did not increase the number of revertant colonies in any tester strain with or without metabolic activation by S9 mix, and did not cause chromosomal aberration in short-period test with the S9 mix or in the continuous (24 h) test. 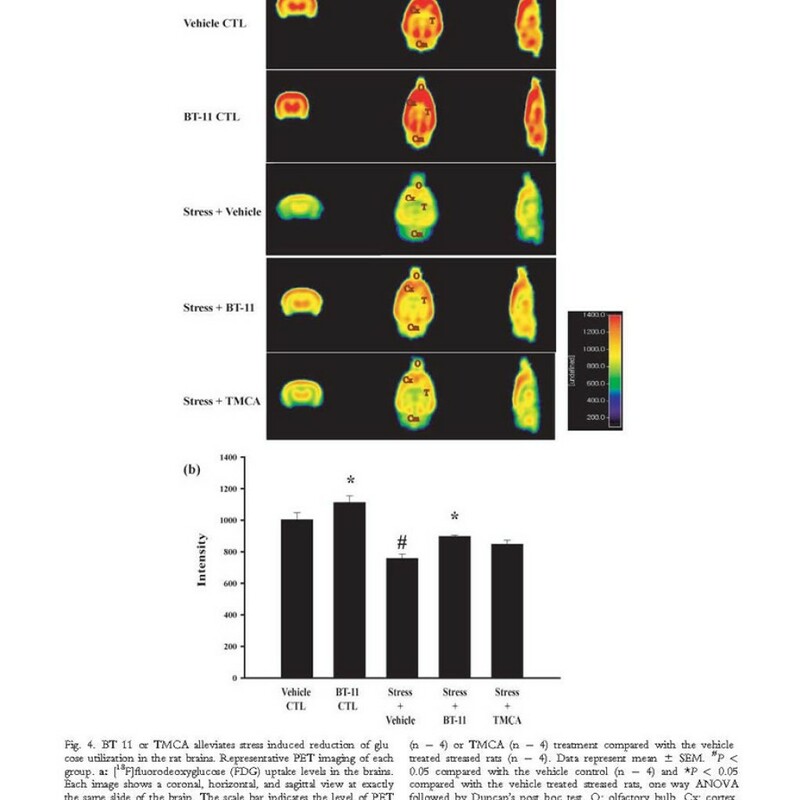 A bone marrow micronucleus test in ICR mice dosed by oral gavage at doses up to 2000 mg/kg/day showed no significant or dose dependent increase in the frequency of micronucleated polychromatic erythrocytes (PCE). 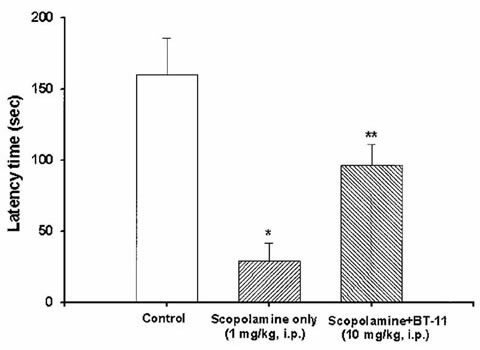 These results indicate that ingesting the rot extract P. tenuifolia is not genotoxic at the proper dose. 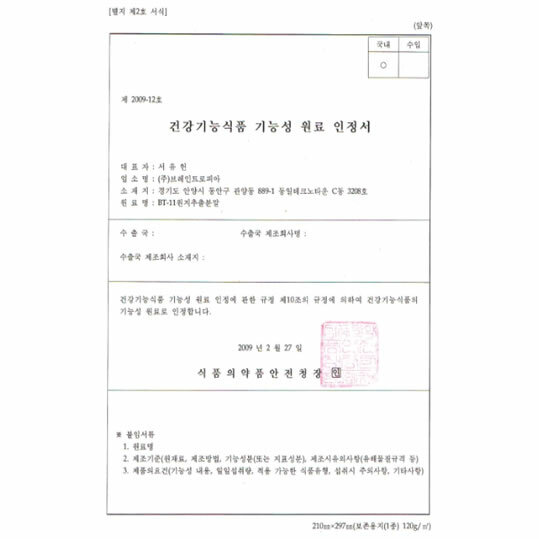 원지추출물 BT-11은 뇌의 신경전달물질인 아세틸콜린을 분해하는 효소의 활성을 억제하여 기억력과 인지기능을 증진시킨다. 또 혈중 콜티코스테론을 감소시키고 독성 아밀로이드 베타 단백질, C단 단백질 등 흥분성 아미노산의 독성을 억제하여 뇌 신경세포를 보호하고 뇌기능 손상을 방지한다. 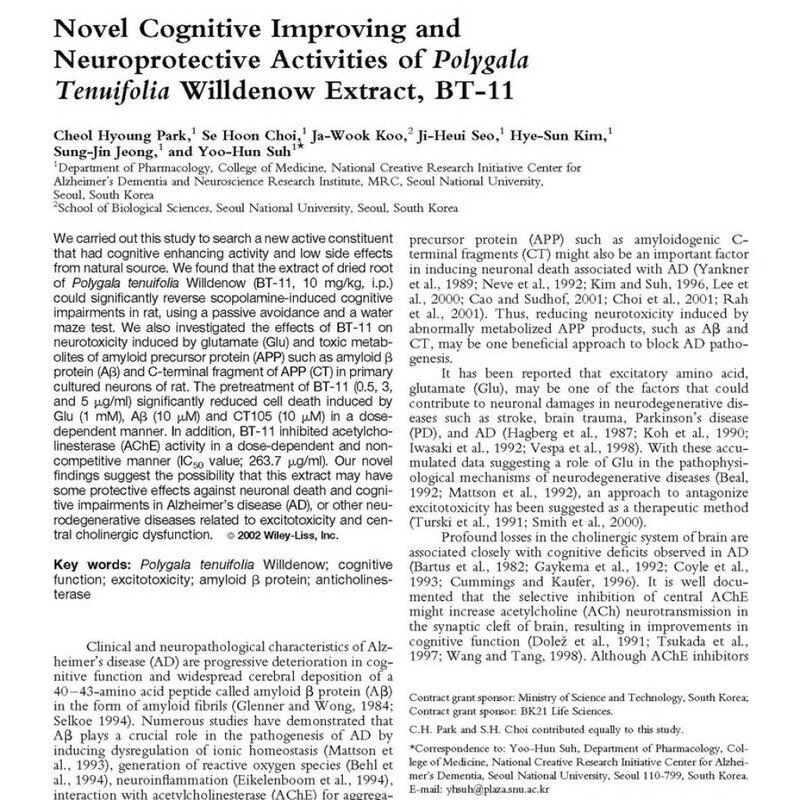 BT-11은 2002년과 2009년에 세계적인 신경학 학회 논문(SCI) Journal of Neuroscience Research에 등재되어 그 기능성을 인정 받았다. 3차례에 걸친 인체시험에서도 그 효과가 증명되었다. 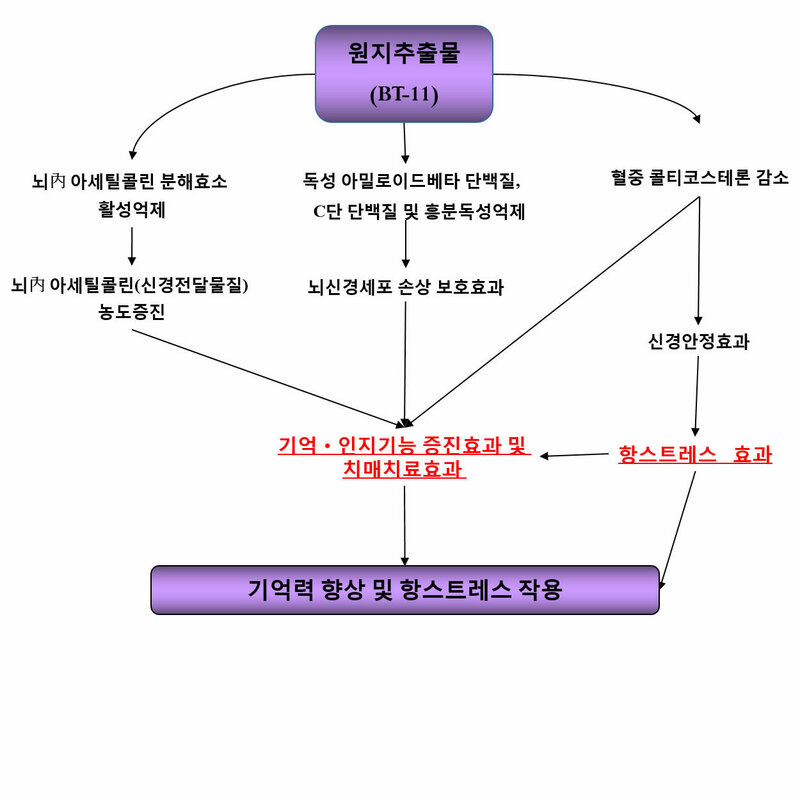 서울대학교 보라매병원 신경정신과 이준영 박사는 “일반인을 대상으로 한 1-2차 시험에서 BT-11 투여 후 기억력이 개선되었다”고 발표했다. BT-11의 성과는 국내 의약계 최고 전문가들이 모여 뇌기능 개선에 새로운 장을 열었다는데 그 의의가 크다. 개발은 서울대 의대 서유헌 교수팀이 이화여대 바이오푸드 네트워크 사업단의 지원을 받아 이루어졌다. 서 유헌교수는 한국 뇌신경 과학회 이사장으로 과기부 지정 치매정복 창의 연구단 단장 등 각종 뇌 관련 학회의 대표를 맡고 있으며 다양한 수상경력을 가지고 있다. 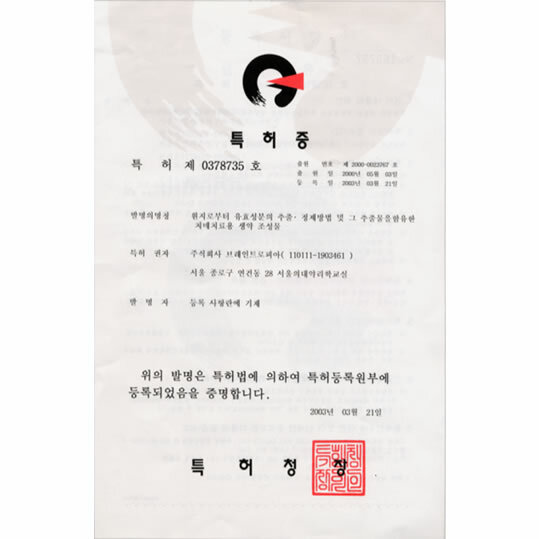 ㈜브레인트로피아는 장기간이 소요되는 신약개발 프로젝트 특성을 감안하여 1차적으로 BT-11 추출물을 이용한 건강기능식품 사업을 병행 추진하고 동사의 핵심사업인 신경독성 단백질 연구와 약리기전 분석연구의 병행을 통해서 알츠하이머 치료제, 뇌혈류개선제/ 뇌졸중 치료제, 신경독성단백질독성/ 생성 억제제제를 개발하는 것은 물론 더 나아가 백신개발과 유전자치료술의 연구개발을 통해 명실상부한 뇌 의학 전문 선도 기업으로 성장하는 것을 궁극적 목표로 삼고 있다. BT-11의 임상실험: BT-11은 안전성과 기능성을 입증하기 위하여 안전성 시험 자료(독성시험,GLP), 기능성 시험 자료(IN VITRO, IN VIVO, 인체시험), 기준/규격 설정 자료, 유통기한 설정자료 등을 확보 하였다. 유전독성시험, 소핵시험, 복귀 돌연변이 시험 등 이상 없다. BT-11은 수중미로테스트에서 스코폴라민에 의해 손상된 기억력을 개선시킨다. 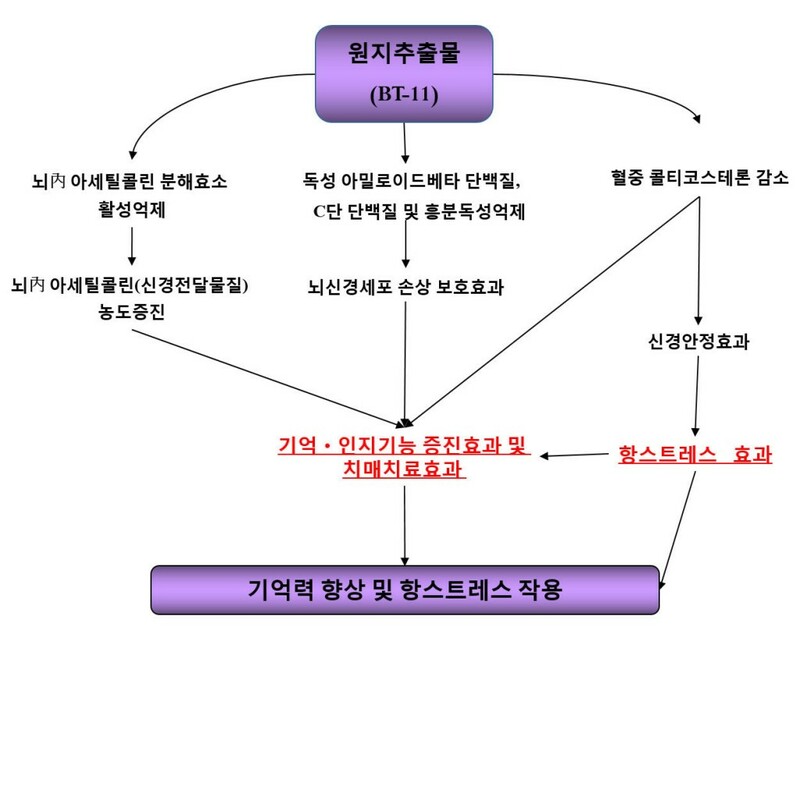 BT-11은 수동회피반응테스트에서 스코폴라민에 의해 손상된 기억력을 개선시킨다. BT-11는 글루탐산, 아밀로이드b 단백질 및 CT단백질에 대한 세포사멸을 억제시킨다. 브레인트로피아 연구소, 서울대학교전임상연구센터, 켐온에서 총 3건의 전임상안전성시험을 실시하였음. 기억력 개선효과 및 안전성에 대한 총 3건의 임상시험을 실시하였다.